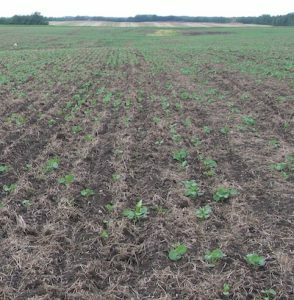 Two CCC agronomy specialists heard this week of high cutworm damage in canola fields seeded into canola stubble. Canola on canola has many potential yield risks and we can add heavy cutworm feeding to that list. 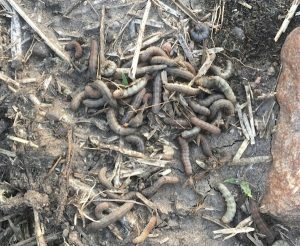 Include cutworms on the scouting checklist for the first one to three weeks after emergence. Any later and management becomes more difficult because (i) spraying a registered insecticide is useless because the cutworms have developed beyond the feeding stage, and/or (ii) reseeding options are starting to be limited. See bare patches like this? Could be cutworms. Include cutworms on the scouting checklist for the first one to three weeks after emergence. Any later and management becomes more difficult because (i) spraying a registered insecticide is useless because the cutworms have developed beyond the feeding stage, and/or (ii) reseeding options are starting to be limited. Test your cutworm knowledge with these four questions, including a “dry soils” angle. 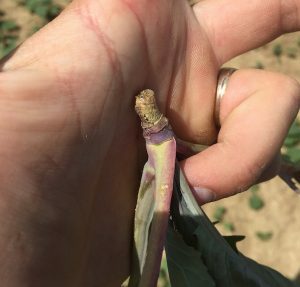 Blackleg, foot rot or cutworms? Test your cutworm knowledge. Answers to these five questions are found in the new guide, “Cutworm Pests of Crops in Western Canada” from Agriculture and Agri-Food Canada. Why scout? Reason one: To confirm that cutworms are the cause. For example, fungal seedling diseases can cause seed and seedling decay that can lead to patches of missing plants Reason two: To identify the cutworm species present as this can influence management decisions. 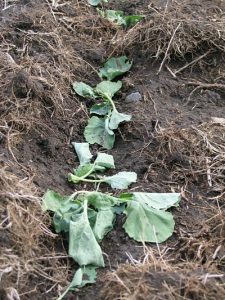 Underground-feeding cutworms are less likely to encounter spray, for one thing. And thresholds vary by species. Usually by the end of June, most of the cutworms that overwintered as eggs or partly grown larvae (including redbacked, as shown in this John Gavloski photo) have pupated and are no longer a risk to crops. In early and warm springs, cutworms will often pupate earlier in June. In cooler spring, cutworm activity often carries into July before pupation. Higher than normal cutworm feeding has been reported in some locations. 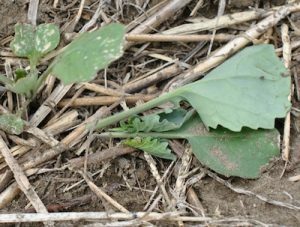 This could be due to various factors, including the long fall, early spring and weed growth to provide food through these times. 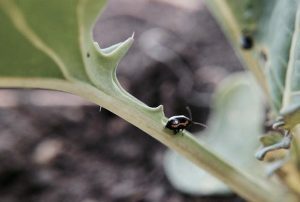 Here are scouting techniques to follow while inspecting canola fields for cutworms.